Hmm, I've got to figure out how to format this blog to be a little wider... 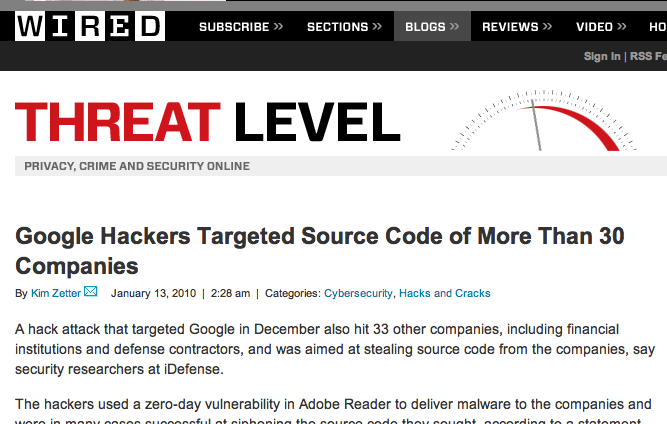 Anyway, the full title reads "Google Hackers Targeted Source Code of More Than 30 Companies". "Google is hacking other companies?!" No, the hackers that hacked Google also hit other companies. But this title really crosses the line from ambiguous to misleading. I can't believe a Wired editor didn't notice that one - even the second comment on the page has already mentioned the goof. In any case, the real story is actually rather interesting - Google is making some bold, high-integrity moves. Check it out on the Google blog post. Google is the best search engine. Availability of nba locker codes and badges are here for free. nba 2k17 vc is wonderful and exciting to visit, play nba games for free. Get to know many more facts about ponline NBA games.